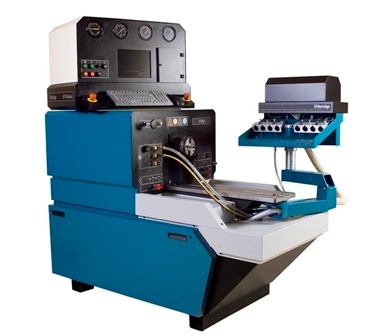 The AVM Majestic Test Stand has been developed as a premium but affordable solution for testing Rotary and small In-Line pumps offering outstanding functionality. 8 cylinder advanced video metering. Ability to pipe up fuel pumps in any order. 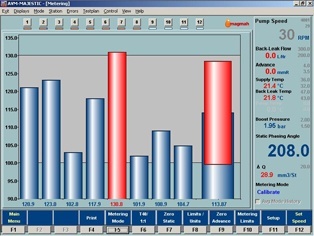 TFT display of pump output data. Compact size and proven user friendly design. Rapid update of test results. Reduces pump test time by up to 50% in comparison with other branded test stands. Figure 1 AVM Majestic, metering screen display. Flat Panel TFT Monitor 8 cylinder Advanced Video Metering via TFT display with a capacity of 500mm3/stroke. Measuring Modes Three measuring modes, calibrate, overcheck and average. Shot Count Push button pre-selection in units of 100, 200, 250, 300 or 500 mm3/stroke. Backleakage Flowmeter display on LCD screen 15-1200cm3/min. Auxiliary 1 7 bar (100lb/in2). Pressure Phasing 80 bar (1200 lb/in2). Boost Pressure Range 0 bar to 3 bar. Units selectable bar, MPa, psi, mmHg, mbar, hPa, kPa. types used in the workshop. Pressure phasing supplied as standard; the phasing angle is shown on the TFT display. Two D.C. supply outlets of 0-25volts at 3 amps which can be parallel connected to give 6 amps. Hours counter displayed via TFT screen. RS232 interface allowing interface to a Printer / PC. Compressed Air 5 to 7 bar (75 to 100 lb/in2). Water 8 l/min (0.75 gal/min) at 1-5 bar pressure at 20°C max temperature.